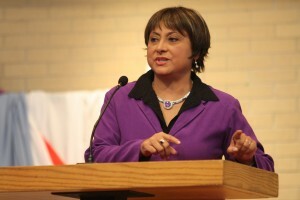 Juana Watson spoke in a special convo about challenges faced by Latinos in the United States. Photo by Tim Blaum. In a bonus convocation on Wednesday, Juana Watson shared stories of challenge and triumph for both herself and the larger community of Latino immigrants to the state of Indiana. Watson, a senior advisor for Latino and immigrant affairs to Indiana Governor Mitch Daniels, is a member of the growing population of Latinos seeking to find their way. Watson grew up in an uneducated family in a small, rural village in Mexico. Her schooling was limited, but her curiosity and thirst for learning was not. However, Juana’s dream of attending the University of Mexico was impossible, as her minimal education would not allow her to pass the entrance exams. Instead, through personal connections, Juana became part of the first group of female police officers in Mexico City. Soon after, she met her husband, an American from Indiana. At age 22, speaking no English and bearing only a junior high education, Watson moved to Indianapolis with her new husband. Clinging to her Spanish-English dictionary for help with puzzling terms like “redneck” and “white trash,” Watson tried desperately to navigate through the maze of an American culture that did not welcome or even accommodate her differences. Still speaking only Spanish, Juana raised three children and was unable to help them with their homework, let alone attend parent-teacher conferences. When she realized that her children were quickly becoming her parents, Watson became determined to conquer the language barrier that still separated her from her kids and from further education. Her daughters helped her through E.S.L. classes, and Juana finally graduated from high school at the age of 28. But she would never be finished learning. Watson informed her convocation audience that the biggest issues facing Latinos in the United States today are language, lack of education and an inability to get jobs. She reported the high school drop out rate for Latinos in Indiana to be 55 percent, mostly due to the language barrier. With opportunities still difficult to reach for Latinos, Juana is using her own experiences as a vehicle for change.